It's hard to believe we're already one year-old! 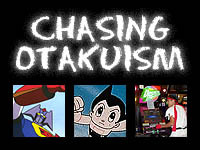 It seems like it was just yesterday when we first beta tested Animefringe's very first layout on the web. In just one year we've managed to put out 12... count 'em... 12 issues that chronicle the world of the otaku. So, to celebrate this first year anniversary, Team Animefringe has sat down and poured through the old issues of Animefringe and prepared a commentary of the past year's worth of issues. Plus, we've packed the article full of production images and tons of Easter eggs. Oh, and we promise tons of fan service. 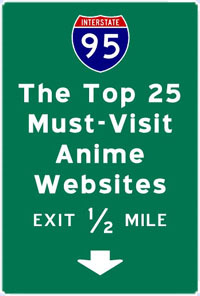 The results are in for Animefringe's Internet poll for The Top 25 Must-Visit Anime Websites and we've got the skinny on all the top sites. The results were close, but the winner's all deserve a round of applause and a lot of clicks. Next exit, 1/2 mile. 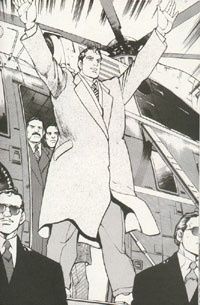 The world may finally know who the president of the United States of America is, but in the world of Kaui Kawaguchi's manga, anything is still possible. Senator Kenneth Yamaoka will do whatever it takes to become the next president, and Japanese reporter Takeshi Jo is determined to understand what drives him. 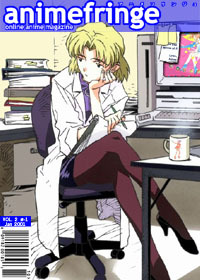 Back in 1999, Team Animefringe tested the waters and tried to figure out just what the anime community wanted to see. Their idea's were big and their dreams were humongous. So, for the first time in a very, very long time we present to you the original content of Animefringe. But, don't think this is just a rehash of the old content. No Way! This special omake sports totally revised layouts, updated content, and some fan service. Click, read, and enjoy. This month Jake takes a look at the trials and tribulations that go into editing manga for the fan community. Filled with real examples and tough decisions editor's have had to make, this months column may just make you pity the poor guy's and gal's that must read through all the non-sense that comes into their offices.